“This member of the philodendron family is terribly easy,” David says. “If you put it in a really strong light, the leaves will get much bigger. If you put it in low light, it’s kind of stringy and has smaller leaves.” If several leaves start to yellow at the same time, that might be a sign that your pothos is getting too much light. Pet owners, take note: This plant’s leaves are poisonous if ingested. Like the pothos, Monstera deliciosa is a member of the philodendron family, but it grows much larger and develops distinctive splits in its leaves, which has earned it the nickname “Swiss cheese plant.” “If you put it outside in the summertime, it can get gigantic,” David says, noting that if you don’t have room for a larger plant, it might be best to leave it indoors. Well-known as a cooling gel that relieves sunburns, the aloe plant also makes a handsome (and easy!) houseplant. Like other succulents, it can withstand longer periods of time between watering. When aloe gets too much light, you’ll know because the leaves will turn a pinkish color in defense. As the parent plant produces “pups,” you can carefully cut away new growths at the roots and replant in their own pots. These trendy trees are everywhere! If you want to join the club, take note: The Ficus lyrata doesn’t like to be around air sources, like vents or fans, and it won’t take to being moved in and out of doors unless the temperature is the same inside and out. If lower leaves begin to yellow, prune them and watch as new leaves appear at the top of the tree. Also in the ficus family, this is the lower-maintenance cousin of the fiddle-leaf fig. Start with a smaller plant, and you can watch this one grow into a larger, more mature tree—especially by moving it outdoors in the summer—with proper care and gradual repotting. Just be careful not to put it in full sun, though; Like all the plants listed here, it prefers filtered or indirect sunlight. 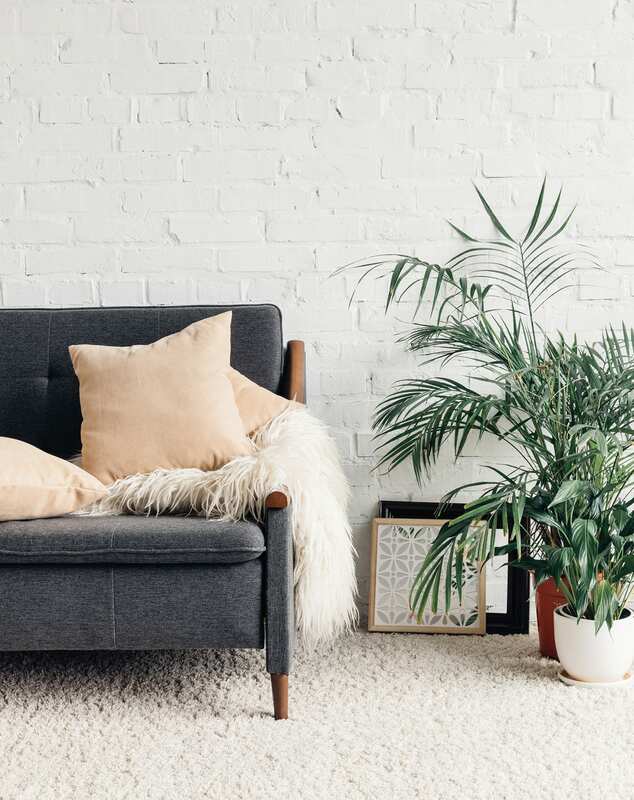 On the spectrum of ease of care, the Zamioculcas zamiifolia is about as easy as they come—they are fine with low levels of light (even the fluorescents of an office or bathroom are enough) and do best when watered infrequently. In fact, the worst thing you can do for it is put it in the path of direct sunlight and overwater. “Dracaena come in many different forms; one popular variety is the corn plant,” David says. The corn plant grows upwards on a tree-like stalk, making it a good choice for a larger, floor-bound pot. These can be pruned every spring or summer by cutting off the stalk. A new cluster of leaves will form where the stalk was cut.